At our October 28, 2015 Board meeting, the LuMind RDS Board voted in three new members. Please join us in welcoming Virginia Bennett Flynn, Patrick Kannon, and Christopher Lis. Virginia Bennett Flynn joins us from Massachusetts, but brings an international perspective to her Board role thanks to her extensive resume of working abroad and with global firms. Virginia will be vital part of the team propelling LuMind RDS’s strategic plan to a successful reality. We are grateful to Virginia will be lending her expertise in many areas, including participating on our Audit Committee. Patrick Kannon has been a longtime supporter and committee member with LuMind RDS. We are so pleased to have Patrick join the Board and help guide our financial management. For the past five years, Patrick and his family have also hosted the very successful Ashley Rose golf tournament outside DC to benefit LuMind RDS. Christopher Lis brings a wealth of knowledge and expertise to the LuMind RDS Board. Christopher joins us from the Chicago area where he will combine his scientific education with his vast experience serving on Boards. He also enjoys the full support of his family, including son Hayden Lis who started a fundraising page in support of his brother Collin, who has Down syndrome. We look forward to learning more about all of our Board members and seeing how their talents help propel LuMind RDS and cognition research to the next level of cognition therapy breakthroughs! This entry was posted in Blog, Meet Our Friends and tagged Board of Directors, Christopher Lis, Patrick Kannon, Virginia Bennett Flynn on October 30, 2015 by LuMind RDS Foundation's plus15 Blog. Dr. Robert Schoen, former president of Research Down Syndrome and LuMind Research Down Syndrome director of event and donor engagement, has retired from the organization. 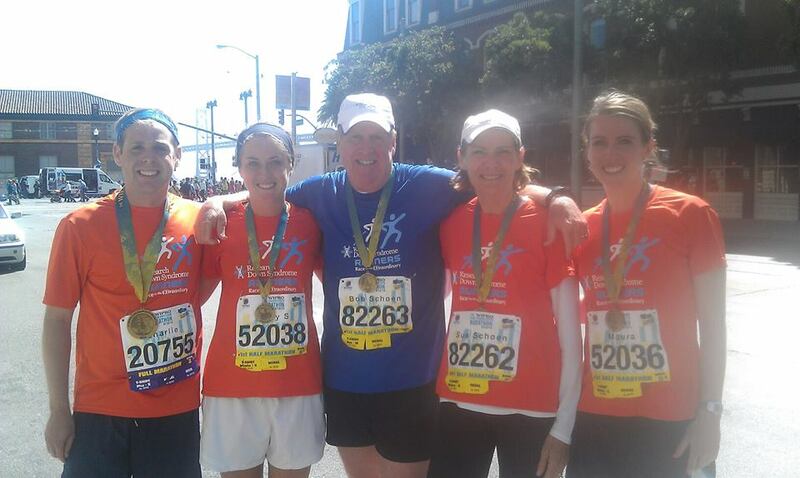 We are so grateful for Bob’s help and advice during the merger transition and join the thousands of RDS supporters – especially the vibrant community of Runners – in thanking Bob for his devotion, inspiration, and dedication to families with a loved one with Down syndrome. Bob is looking forward to more time with his wonderful family and relaxing in the fabulous bier garten he created in his backyard, inspired by his years living in Germany. But we are certain he won’t forget his friends and fans at LuMind RDS! Bob and his family, especially wife Sue (on Bob’s left), fully supported the mission to improve cognition for people with Down syndrome. Thank you Schoen family! “Bob is a very bright, thoughtful, caring and passionate advocate for cognitive research to benefit the Down syndrome community. He has been tireless in his work on their behalf and will be greatly missed,” said Dan Flately, Vice Chairman on LuMind Research Down Syndrome and co-founder of Research Down Syndrome. 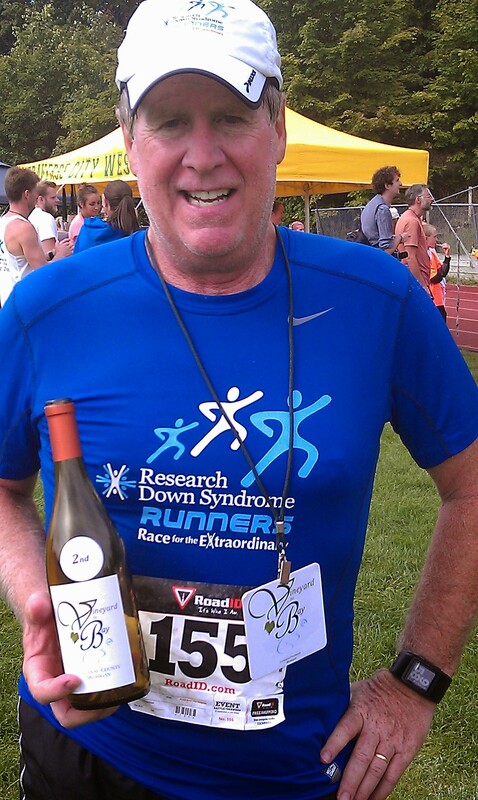 In addition to developing and nurturing a dedicated community of Runners through initiating and growing the RDS Runners program, Bob tapped into his scientific background to explain and educate the importance of Down syndrome cognition research. As anyone who attended one of his Research presentations, “Dr. Bob” had a gift for making technical information accessible to our audiences. The Board and staff of LuMind Research Down Syndrome Foundation are so grateful for Bob’s commitment and his guidance during the merge of the two organizations, especially helping Kate Dochelli take over the reins of the Runners program. Dr. Schoen speaking at the 2014 Tribute 21 event in Washington, DC. Bob remains a part of the community he help to create and nurture, attending fundraising events as a “VIP-for-life,” regularly posting about his runs on Facebook, and continuing to inspire and motivate people to Race for the Extraordinary. We send Bob, Sue and their family our very best wishes and gratitude for years of impassioned devotion. This entry was posted in Blog and tagged LuMind RDS Runners, RDS Runners on October 26, 2015 by LuMind RDS Foundation's plus15 Blog. Chad (wearing 31442) and Leyda (40770) are front and center for this photo from the Chicago Marathon on October 11, 2016. They are posing with their fellow LuMind RDS Runners at the pasta dinner the night before the race. Chad Simon is a student at Fort Hays State University – and a long-time runner for the LuMind RDS Runners program. Chad runs along along with his wife Leyda in support of their daughter Ashylnn who has Ds. Chad and Leyda were profiled in an article in the Fort Hays State University news outlining their commitment to the Runners program. We are so proud to have Chad and Leyda on our team! Enjoy the article. This entry was posted in Blog, Meet Our Friends, Runners and tagged Chicago Marathon, LuMind RDS Runners on October 23, 2015 by LuMind RDS Foundation's plus15 Blog. LuMind Research Down Syndrome Foundation is proud to announce we’ve joined Down Syndrome International (DSi) as an affiliate member. DSi is a global network of Down syndrome organizations representing 131 countries around the world. They’re aiming to channel the expertise and experience existing in many countries and use that knowledge to benefit other countries, especially those in the developing world, to better opportunities for people with Down syndrome. LuMind RDS’s partnership with DSi took off with a burst of speed. In addition to being part of an international network of Down syndrome organizations, LuMind RDS is collaborating with DSi on events such as a meet and greet with Formula 1 legend and Down syndrome advocate Damon Hill in Austin, Texas and promotion of the LuMind RDS Runners program. LuMind RDS is proud of pushing the needle on Down syndrome cognition research and supporting the spread of best practices and awareness by joining DSi. Recently DSi has worked on projects providing information, expertise and training in Tajikistan and Oman and this year invited organizations from Albania, Nepal, Bangladesh, Botswana, Vietnam, Uganda, Nigeria, Bhutan and Mauritius to take part in a program at the World Down Syndrome Congress in Chennai, India. Boys said their efforts focus on producing new information resources on medical care, development and education and employment, independent living and participation in society. DSi then looks to build the capacity of national Down syndrome organizations and provide training so that they can successfully advocate for people with Down syndrome in their countries. Founded in 1993, DSi may have a global reach, but their current footprint echoes the beginnings of Down syndrome. DSi is based in Teddington, England at the former home of pioneering Victorian Physician Dr. John Langdon Down, after whom Down syndrome is named. Learn more about the great work DSi is doing around the world and look for more events and opportunities for collaboration between DSi and LuMind RDS. This entry was posted in Blog, Ds Affiliate Organizations, Meet Our Friends and tagged Down Syndrome International on October 21, 2015 by LuMind RDS Foundation's plus15 Blog. Romp For Research 2015 from Keith Brady Media on Vimeo. So far, more than $167,000 has been raised this year with donations rolling in daily! If we can reach $200,000, the ROMP will have contributed more than $2 million dollars to Down syndrome cognition research through its decade of celebration. Let’s reach that milestone! If you couldn’t make it, but still want to show your appreciation of the great work of the ROMP organizers, consider making a donation to the event. We’ll be continuing to accept your support until the end of the year. A big heartfelt THANK YOU to Anthony Providenti, Mary Costello-Lazare, and Steve Lazare, as well as to the entire ROMP committee. This entry was posted in Blog, Events, Meet Our Friends and tagged ROMP FOR RESEARCH on October 16, 2015 by LuMind RDS Foundation's plus15 Blog. We were so happy to represent cognition research at the 9th Annual Alexander’s Angels Buddy Walk on October 10, 2015 on Long Island. The sun was shining, kids were laughing, and a good time was had by all in celebration of Down syndrome Awareness Month. Our VP of Development, Anne Tippett, was on hand to meet people, take photos, and spread the word about Down syndrome cognition research. The warmth and enthusiasm of the crowd and from Esther Gómez-Nieto was contagious and so inspiring! We have so appreciated the tremendous support from the wonderful families of Alexander’s Angels over the past several years. Please learn more about this amazing organization in this past post on the Plus15 Blog. This entry was posted in Blog, Ds Affiliate Organizations, Meet Our Friends and tagged Alexanders Angels, Buddy Walk on October 13, 2015 by LuMind RDS Foundation's plus15 Blog. Research Down Syndrome is now LuMind Research Down Syndrome Foundation! Please visit our new site, http://www.lumindfoundation.org/tribute-21, to learn more and to purchase tickets for the 2015 Tribute 21 event! This entry was posted in News on October 7, 2015 by rcschoen7.